The Fertile Crescent, the Yangtze basin, Meso America, South America: those are the places that spring to mind as birthplaces of agriculture. Evidence is accumulating, however, to strengthen eastern North America’s case for inclusion. Among the sources of evidence, coprolites, or fossil faeces. Fossil human faeces. And among the people gathering the evidence Kris Gremillion, Professor of Anthropology at Ohio State University. She was kind enough to talk to me on the phone, and I made a silly mistake when I recorded it, so please bear with me on the less than stellar quality. I hope the content will see you through. And I’ll try not to let it happen again. A few words about the picture; after failing to come up with anything striking, I gave in to the inevitable and searched for coprolites. The guy in the picture is Dennis Jenkins, an archaeologist at the University of Oregon. 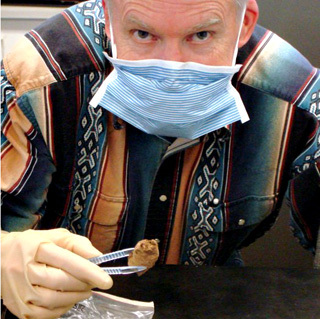 In his forceps is a piece of dried human faeces dated to 14,300 years ago. The sample is not without interest, but it is also from way across the other side of North America. Still, it is a coprolite (or at the very least palaeofaeces), and it is the best I could find. In looking for it, though, I stumbled across The Cambridgeshire Coprolite Mining Rush. Wikipedia has the bare bones of the story – coprolites rich in phosphorus were discovered outside Felixstowe in 1842 and became the basis of a boom industry to extract the phosphorus as fertilizer. The man credited with discovering the coprolite deposits was John Stevens Henslow, the Cambridge botanist who gave up his place on HMS Beagle to his young friend and protégé, Charles Darwin. The coprolites came a decade or so after the Beagle set sail, and the company that extracted the fertilizer went on to become Fisons, a glorious name in British agrochemicals. Small world, eh? Funnily enough, another account makes no mention of Henslow, and describes the coprolites as “phosphatised clay nodules”. I’m afraid that’s all the digging I have time for; I gave up just as soon as I struck this somewhat broken motherlode, which tantalisingly says coprolites were “thought by some at the time to be fossilised dinosaur droppings”. Thought to be? No doubt there’s a lot more to know. If you know me from the other place, you know that I reviewed Kristen Gremillion’s book Ancestral Appetites there, and that’s what prompted this interview. You want more coprolite stuff? And not just human? You need The Dung File. End music by Douglas Blue Feather, who might just possibly be from around the Kentucky area, which is a close enough connection for me. This history of domestication and agriculture encompasses North America too.